Ekana Sportz City Pvt. Ltd. is a Special Purpose Vehicle (SPV) tasked to develop, design, finance, construct, operate, maintain and transfer the sports infrastructure in accordance with the provisions of the Concession Agreement entered between Ekana Sportz City Pvt. Ltd. and LDA. As per the Concession Agreement signed on 8th July 2014 two projects as under are to be developed in the 137 acres of land on the Southern Banks of River Gomti. The Sport Infrastructure Will Be Built In 71 Acres Parcel Of Land And Real Estate Infrastructure Development Zone Is 66 Acres. The SPV will be responsible for designing, developing, constructing, operation & maintenance and transfer of the International cricket stadium and multi-purpose sports complex in Lucknow in accordance with the provision of long term concession agreement . Under this agreement the concession period will be of 35 years which implies that the special purpose vehicle (“SPV”) will conduct the business of the sports hub for 35 years after the scheduled completion date, viz 25th feb 2017 to 25th feb to 2052. Ekana Sportz City Pvt Ltd. is presenting a haven of deluxe residential dwellings in perfect concert with modern sports facilities in the city of Nawabs, Lucknow. "Ekana Sportz City", nestled in the lap of nature is to create a splendour of luxury spaces to include in its bouquet, sporting facilities of International standard along with the other essential needs to include Hotels, Shopping Malls, Education and Medical facilities. In this area of architectural opulence and spirit of sports will blossom Ekana Sportz City along the Southern banks of Gomti River an address of pride & elegance for not only the future residents but also for the citizen of Lucknow and Uttar Pradesh. 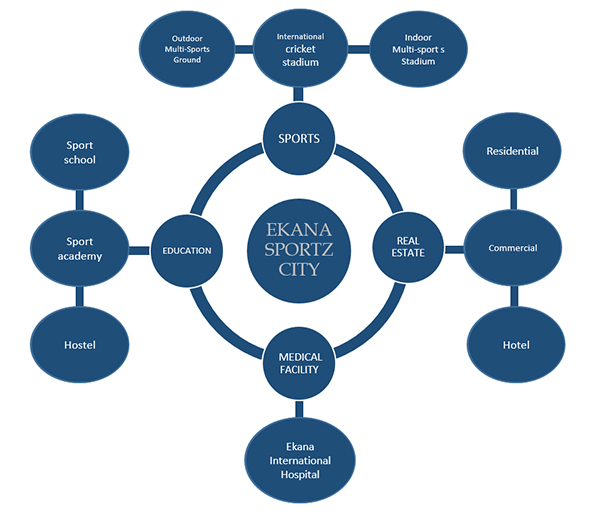 'Ekana Sportz City Pvt Ltd' is a consortium of two companies who are privileged to create this haven of joy and comfort promoting sports and health for all. The two companies who are jointly constructing this dream project are NCC Ltd. and GCC Pvt Ltd. The state of Uttar Pradesh is having the largest population in the country and thus the requirements of sports facilities are also large. Accordingly, Department of Sports and the Government of Uttar Pradesh is working towards promoting excellence in sports. It will play a critical role in accelerating the development of sports industry, excellence in participation and will take sports to the next level amongst the states of our country. Special purpose vehicle /SPV is a legal entity (usually a limited company of some type or sometimes, a limited liability partnership ) created to fulfill narrow, specific or temporary objectives.